The windows around your home or business do more for your space than you might think. Windows can affect your views, your lighting and your bills. These panes of glass can make a huge impact on your space and that is why our Gorillas are trained to treat your windows right! Our Saskatoon window cleaning not only wipes glass clean but keeps an eye on your frames and sills as well. The first step to proper window cleaning is knowing which tools to use for the job. Getting the most out of your windows requires more than paper towel and a blue cleaner. This might be the first cleaning method that comes to mind but it is hardly an effective one. The act of wiping down windows can create a static charge. This static acts like a magnet for any airborne debris that might be floating around. Friction can come from anywhere but when you come prepared with rubber tools, you neutralize the shock that comes from it. 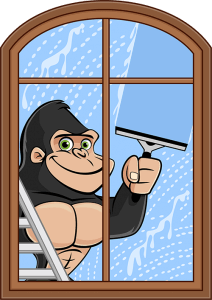 That is why our Gorillas approach each window frame with a rubber squeegee and an eco-friendly cleansing agent. Despite being good climbers, our Gorillas are not keen on scaling buildings. That is why our technicians utilize water-fed poles to reach windows up to four storeys high. Far from just providing you with a clear view, your windows are an important part of your home or business. When our Gorilla are called-in, you get more than a streak-free shine. It might be hard to keep an eye on the integrity of your windows but our Gorillas can help! Through proper maintenance and cleaning, you can have an updated assessment of the condition of your windows. Whether it is your sills or frames, keeping all parts of your windows in good working order is key. A degraded seal around your windows can let drafts in or allow heat out. This can affect you not only your comfort – but your wallet as well!